What are the best wood pellets? 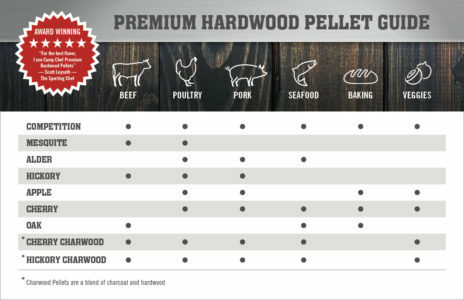 Which hardwood should you choose for your meat? Questions like these are famous in the grilling world. After all, you want that precious meal on the grill grates to turn out the best it can be. Here are some things you’ll want to consider when choosing your wood pellets. Be sure that you are using only food-grade pellets for cooking with your pellet grill. Some grillers will tell you that heating pellets (that is, wood pellets used in wood-burning stoves) will work just as well, but this isn’t necessarily true. Many types of heating pellets are made from woods that you wouldn’t want to use for smoking, like pine or spruce. These woods will ruin the flavor of your food. Heating pellets may also be sourced from wood products like plywood or particle board, and include binding agents that could also sour the flavor of your meat. In short, since heating pellets are not produced with food consumption in mind, there are no real standards you can count on when it comes to safe wood sources and binders. This isn’t an issue if you’re using the wood to heat your home; but when you’re talking about food, you could be risking more than just the taste. Stay safe and cook smart with food-grade wood pellets. Ours are made from pure hardwood, kiln-dried and heat-compacted with no fillers or binders. They’ll burn faster and cleaner than anything else you’ll find on the market. Next, you want to pair the best pellets with the meal you’re cooking on the grill. The “flavor” of the pellets has less to do with the actual flavor of the wood and more to do with the strength of the smoke flavor you get from burning it. You can think of pellet flavor on a scale from mild to strong; mild flavors work best with delicate foods, while strong flavors work best with heartier foods. Check out our flavor guide below. A Camp Chef pellet cooker is on my wish list. It’s just that I have limited space, and my significant other isn’t a fan of anything that is smoked, except for pork. Still, I keep checking on a regular basis regarding price and availability. It may happen, but not right now. They are made from 100% natural hardwood with no added fillers, binders, or flavors. Why don’t yall have pecan? It’s a hardwood we are working on for the future. Keep your eyes out for it! Do you carry Pecan Wood pellets? So the question is and it is the same for all brands of pellets,,, What is the ratio of “hardwoods ” in the mix. Yours to is obviously a blend, not 100% the wood that it is named. There are essentially flavorless filler woods used in many pellets. I find it interesting that none of the pellet makers actually reveal what the product is made from. No ingredient list here. Why not? Thanks for the question, BBQ Bill. Our pellets are 100% hardwood–no flavorless filler woods or binding chemicals. Each blend is our proprietary blend with an alder base and whichever other hardwood is named on the bag (mesquite, hickory, etc.). Every pellet blend is made up to have the best burn flavor and burn properties. We don’t have an exact ratio. Hope that helps! I have a Smoke Vault 24 and love it. Would I just put these pellets in the chip tray dry to use in my Smoke Vault? That’s exactly right, Todd. Enjoy! My wife received a Smoke Pro SE for Christmas. I’ve used it on brisket several times as well as Tri-Tip and burgers. Fantastic results with everything. My wife has asked several times if there was a way to get “charcoal flavored smoke.” I imagine using Oak pellets might be an option but have not found any. Do you have any suggestions short of a charcoal grill? Hi, Stephen! Unfortunately, you’re going to have wood-fired flavor whenever you use hardwood as your fuel. This will taste quite different from charcoal smoke. However, if you have a Sear Box or one of our stoves as part of your outdoor kitchen, you can finish your food with a nice sear, which will lend some of that char flavor that your wife enjoys. You can also try cooking at higher temps where you’ll get closer to a charred taste and less of a smoky, smolder flavor. 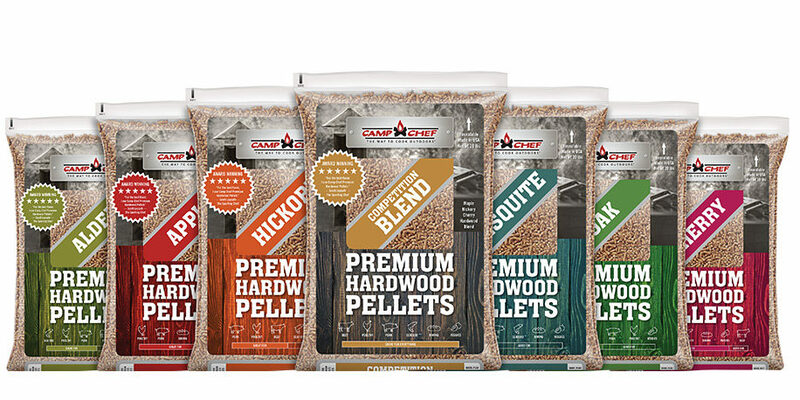 We recommend using Camp Chef’s premium hardwood pellets in your Camp Chef pellet grill, as they are made with no chemicals, fillers, binders, or added flavors. It’s 100% pure hardwood. With many other brands of pellets, you don’t have that guarantee. If you do decide to choose different pellets, just double check that they are made from 100% hardwood with no additives. Def a Big WISH list to get a $899.00 Pellet Pro. I wish they can come with a way to send me one as a give away. I would be in heaven. To me these are the best grills EVER!!! whoah this weblog is wonderful i like reading your articles. Keep up the good work! You know, lots of people are hunting around for this information, you could help them greatly. It’s a pity you don’t have a donate button! I’d certainly donate to this excellent blog! I suppose for now i’ll settle for book-marking and adding your RSS feed to my Google account. I look forward to fresh updates and will talk about this site with my Facebook group. Chat soon!